This blended mix of nuts and dates is much healthier than the usual truffles made with chocolate and cream. They're gluten free and vegan, while tricking everyone into thinking they're being naughty. Melt the chocolate in a small bowl set over a pan of simmering water or in 30-second blasts in the microwave, stirring regularly. Remove and set aside. Put all the nuts in a mini-blender and blitz until very finely chopped. Add the dates, orange zest and vanilla extract and blend until smooth. Add the melted chocolate and blitz again until well combined. Divide the mixture into 12 even-sized pieces, about 20g each. Taking one piece at a time, flatten it slightly in the palms of your hands and place two ends of one piece of string in the centre. Shape the mixture into a ball, enclosing the string and with the loop sticking out. Repeat to make all of the balls, arranging them on the lined tray as you go. 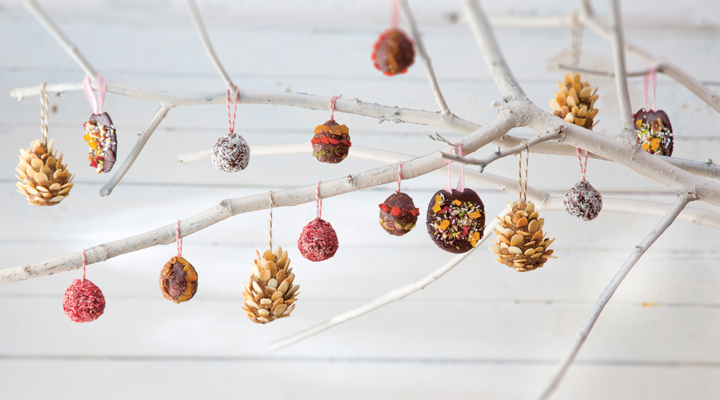 Stick small pieces of the pistachios and dried fruits to the outside of eight of the baubles, arranging them in rows or other pretty patterns. Put the coconut in a ziplock food bag and, if liked, toss through a little red food colouring until completely coated. Toss the remaining baubles in the coconut until completely coated, pressing them lightly through the bag to stick if necessary. These will keep for up to three weeks in the fridge, layered between baking paper in an airtight container.